Best friends Matt and Cole grapple with their changing relationships during the summer after high school in this impactful, evocative story about growing up and moving on from a traumatic past. Surviving was just the beginning. Eleven years after a shooting rocked the small town of East Ridge, New Jersey and left eighteen first graders in their classroom dead, survivors and recent high school graduates Matt Simpson and Cole Hewitt are still navigating their guilt and trying to move beyond the shadow of their town's grief. Will Cole and Matt ever be able to truly leave the ghosts of East Ridge behind? Do they even want to? As they grapple with changing relationships, falling in love, and growing apart, these two friends must face the question of how to move on—and truly begin living. Joseph Moldover is a clinical psychologist who works with children, teenagers, and their families. He lives with his wife and their four children in Massachusetts. He has published a number of short stories, mostly under the name Joseph Sloan. 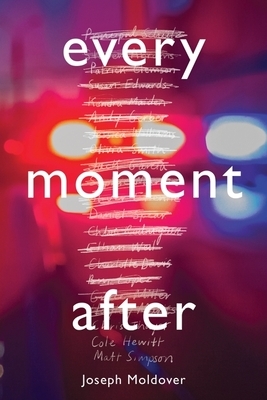 Every Moment After is his debut novel.